Performance additive chemical stabilizes Fuel-Oil in tanks and tankers to prevent the separation of water from the Fuel-Oil micro-emulsion. Performance additive chemical stabilization of the micro-emulsion avoids cut-off of combustion by the Fuel-Oil by improving atomization of carburant in the injectors. Performance additive chemical eliminates residual lumps in the Fuel-Oil which plugs filters and injectors. 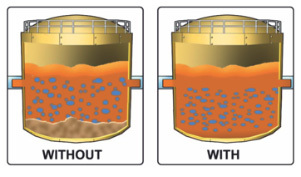 The residual lumps can occur in tankers and tanks that are left standing up in the future. OilFlux™ BFO Performance additive chemical is specially formulated by new chemistry to eliminate Fuel-Oil problems resulting from unstable micro-emulsion and lumps in tankers and tanks. OilFlux™ BFO Performance additive chemical is applied in very low dosages of 0.1% by volume for regular maintenance and up to 1% by volume to shock treat Fuel-Oil in tankers and tanks to improve combustion.